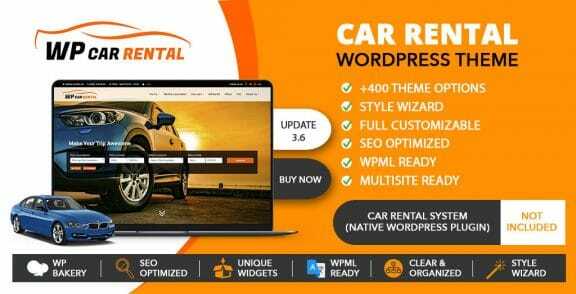 Wp Car Rental Theme has been developed to be used with Car Rental System for booking system, to be purchased separatly at codecanyon. Alternatively it can be used based on contact form 7 plugin, without booking system, for booking request. Grant access to ticket support for 6 month. Want a discount? Become a member by purchasing Grant/Extend Support for 6 month! Combine Car Rental Theme and Car Rental system options to reach your desired design and booking mode with in minutes. Every option can be modified independently after wizard. .Improved custom elements for wpbakery and added new options as css animation. .Sub menus of mobile menu are now collapsible. .Top bar company information is now sortable. .Added new option to set social networks colors for top bar and widgets independently. .On booking process, if maximum amount available of an extra is 1, it will be displayed as a checkbox instead of quantity selector. .Fancy title and counters wpbakery elements where not translatable with WPML since last version. .Booking code on thank you page was appearing at page bottom on copy button execution. .Added actions for top bar login form. Normally used by captcha plugins. .Prevent word “Date” to disappear on return date after pickup date selection. .Item features are now hidden on mobile mode and grid view, to have item price in viewport. User can expand features to see them on click. .Added optional setting to show terms and conditions at step 4 of booking process as pop-up. .Added click to copy to booking code at thank you page. .Improved cart functionality, used on multi item rental. .Added manufacturer filter and made filters combinable. .Open booking info will now auto close others before opening. .Top bar language selector was not clickable on dropdown mode. .Homepage form slider images where not showing properly in some IOS devices. .Bottom bar logo paddings where not working, and changed for margin, to not reduce image size. .Added optional box shadow for buttons and CRS headers. .Added option to change, “Related posts“, “Other cars” and “Other locations” text. .Added new style options for footer widgets. .General CSS and HTML improvements. .Added new option to set blog columns. .Added new options to set if show, categories, date and author independently. .Improved customer fields style and responsiveness of booking process. .Added new style option for booking summary of booking process. .Improved items list and search results filters to be combinable and a new option to set the “no results” text. .Added new options to visual composer to set body type or single item for cars list and cars price table shortcodes. .Bug on real data counters. .Visual composer buttons colors, where not being applied correctly while using theme style. .Improved primary and mobile menu. .Option to remove timepicker (if active) on mobile devices to use its native selector interface. .Fixed bug on items description page while having less than 3 images, images where too small. .Fixed a responsiveness bug while having several social networks on footer. .Visual Composer to latest version (WordPress 5.0 ready). .Removed color from quantity selector to use site regular buttons colors. .Fixed issue on calendar view when showing booking info, if bookings where on bottom where not totally visible. .Fixed Bug on single car booking process since version 3.4.3.
. Added an option to set the entity between bottom bar links.
. Added the possibility to set top bar follow us text as strings used for car rental system.
. Added the possibility to switch car rental system search results and items list between list or grid. For admin the possibility to set default mode.
. Added optional timepicker for car rental system booking form.
. Improved autofocus to not auto deploy car rental system form location or date inputs filled previously.
. Fixed Car rental system bug related to Enhanced Ecommerce. .Improved responsiveness on step 3 of booking process. .Improved cart feature, used for multiple items bookings. .Added ability to add background image to the header or footer. .Added new widget to show recent posts with thumbnail. .WP Car Rental add-ons plugin: fixed bug with real data based counters. It was not possible to select the source. .WP Car Rental Add-ons plugin: bug fix. .Color wizard: car rental form background was not properly set. .Color wizard: text colors were not properly set. .Go to top button: fixed position on mobile when reaching the bottom, to not interfere with bottom bar content. .Booking steps data: fixed small css issue. .Content Padding: removed notice while setting padding to 0. .Car Rental Addons: bug fix. .Footer: Improved to be able to add more than 1 widget per column. .Menu: Add box shadow to submenu and mobile menu, and optional padding to mobile menu. .WP Car Rental Calendar plugin: added small improvements. .WP Car Rental Add-ons plugin: added small improvements. Good theme I love it is the best that I try!! and very good support!! they help my a lot! Thank You! We truly appreciate your comment. The best theme ever continue the good work!!! !